Did you know the Bald Eagle’s eye-sight is four times sharper than a human’s? So, soar above it all with your Eagle-eyes scanning for clues! Use the Eagle’s super-power to help your child develop their clue-searching skills. Look for clues within: the pictures, the words, the sentences, the pages before, the story-line, the characters…look everywhere! 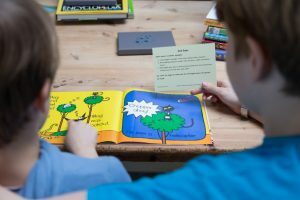 A really effective clue-searching technique for younger readers is to ask your child to search for clues within the picture and ask them to articulate out loud what they can see and who they can see before starting to read. Point at each picture clue and have fun with this before you start actually reading – making predictions and spotting clues about emotions and expressions on faces is a fantastic way to build early inference skills, and gives your child more clues to draw upon when they start reading the words too. Using picture clues and word level clues at the same time will boost fluency, speed of word recognition and overall confidence.